A new paper in the journal Science has shown that the neurotransmitter serotonin may be the key to controlling the behavior of locusts. 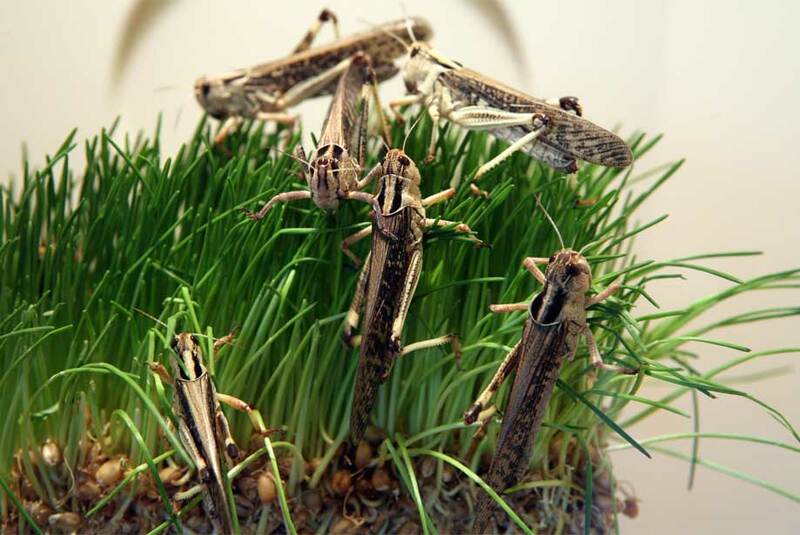 Locusts possess a unique genetic advantage in that they are able to transform themselves – changing from green to brown, eating more, getting muscular, mating more, and congregating in swarms. From 1850-1880, Americans moving west over the Great Plains encountered a pest problem: the Rocky Mountain Locust. This species of locust, the only one to be found in North America, became an utter nuisance for the settlers. These locusts swarmed across the landscape, colonizing and re-colonizing breeding grounds, and searching for food. Unfortunately for the settlers, locusts prefer cultivated crops to prairie grasses – creating an agricultural nightmare for the farmers. One observer in Nebraska in 1875 reported seeing a mile-high stream of locusts pass overhead for five days straight. That swarm ate everything in its path, including crops, but also fence posts, leather, and even the wool off of sheep. This was such a challenge to the settlement of the Western United States that bounty hunters were offered $100 per bushel of dead locusts, and settlers even tried dynamiting their breeding grounds. Now, finally, 140 years later, scientists think that we may have found a reason for this behavioral change. This finding could pave the way to a method to block the formation of locust swarms, which still devastate agriculture and cost millions of dollars to control. The researchers discovered that the change in behavior was correlated strongly with a serotonin increase in the thoracic ganglia, a part of the central nervous system. Then, they showed that if the production of serotonin was blocked, those locusts would never undergo the behavioral change. Enzo Life Sciences offers the most sensitive, specific and flexible alternative to more costly and time-consuming methods for serotonin detection. Check out our selection of over 300 ELISA Kits, including our Serotonin ELISA Kit.